Plot: A woman is boxed out by the male sports agents in her profession, but gains an unexpected edge over them when she develops the ability to hear men's thoughts. Starring: Wendi McLendon-Covey, Max Greenfield, Taraji P. Henson, Kellan Lutz. 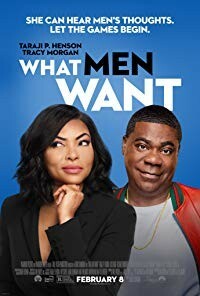 distributed by Paramount «What Men Want» in the US movie theaters released on February 8, 2019 and has grossed over $70 million worldwide; dvd and blu-ray release date was set for May 7, 2019. Rent from Netflix and Redbox from May 7, 2019. «What Men Want» in the UK released in movie theaters on March 15, 2019. The movie estimated to release on dvd and blu-ray some time in June or July 2019.